Nova Scotia before the time of the Confederation debates was a prosperous colony of approximately 350,000 people, spread around the coastline and throughout the Annapolis Valley. The population included people of British, Irish, Scottish, German, Mi'kmaq and Acadian descent. The largest community was the city of Halifax; other major centres included Yarmouth and Truro. The economy was based on the traditional industries of fishing, shipping and shipbuilding, agriculture, and natural resources such as timber. However, the newer industries of manufacturing and the railway were beginning to make an appearance. The region had a close trading relationship with New England, aided by proximity and the Reciprocity Treaty. The sea-based economy of the region, combined with Halifax's function as a garrison city and its relative isolation from the Canadas, helped to forge a close relationship with Great Britain. The colony was one of the first to be given responsible government, in 1848. While men had almost universal suffrage, no women had the vote. The major political parties were the Conservatives and Liberals; their leaders were Charles Tupper and Adams George Archibald, respectively. Other major figures in Nova Scotia's political and public life included Joseph Howe, Jonathan McCully and William Annand. The spring and summer of 1864 saw discussion of a possible union of the Maritime colonies. In fact, Charles Tupper based part of his 1863 election platform on the promise to call a conference on the matter. The collapse of negotiations with the Province of Canada for an extension of the Intercolonial Railway (ICR) has been suggested as a factor in the issue's prominence -- it was felt that the region would have more influence bargaining as one large group instead of three small ones. During its spring session, the Nova Scotia legislature considered a resolution calling for the appointment of delegates to a Maritime union conference. However, interest then languished, possibly because of renewed Canadian interest in the ICR. It was not until the summer of 1864, when the Canadians expressed interest in the proposed conference, and requested permission to attend in order to make a presentation regarding a full British North American union, that discussion of the matter was renewed. The colonies were forced to actually organize a conference for the Canadians to attend, and to appoint delegates. It was decided (after much deliberation) to hold the discussions at Charlottetown, Prince Edward Island, beginning September 1, 1864. 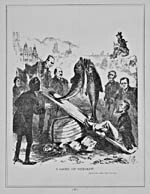 In the interest of promoting closer relations amongst the colonies of British North America, D'Arcy McGee organized a visit to Nova Scotia and New Brunswick by a delegation of Canadian politicians and journalists for the late summer of 1864. In Nova Scotia the visitors, after landing at Windsor, proceeded to Halifax, where they stopped for several days. For entertainment, there were picnics, banquets, and excursions. A warm disposition toward each other, and toward the idea of a union of the colonies, prevailed. 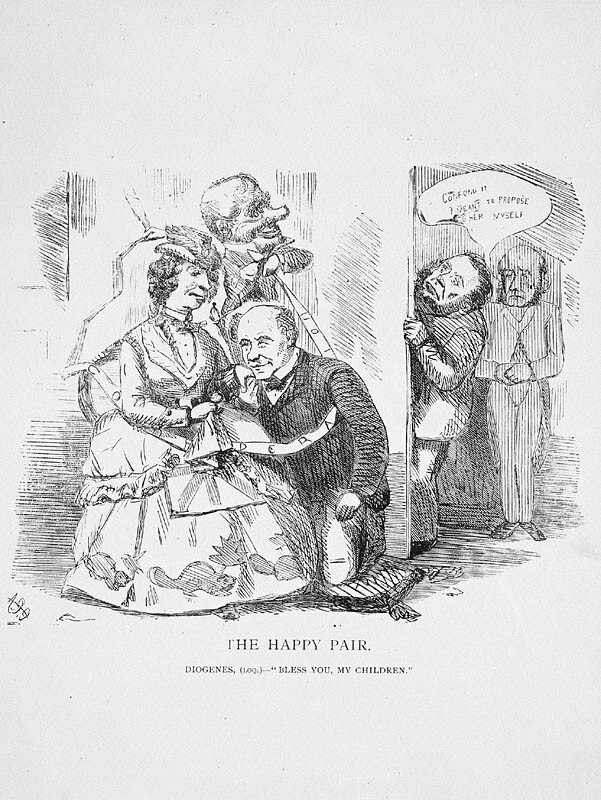 Newspapers of the time were particularly amused by the "Hodge Podge dinner" held for the delegates. Even Joseph Howe, who later became a vehement anti-Confederationist, gave a speech supporting union after one of the banquets in Halifax. The delegates from Nova Scotia were appointed from all levels of the government, and included government and opposition members. They included Premier Charles Tupper, Opposition Leader Adams George Archibald, Opposition Upper House Member Jonathan McCully, Government Upper House Member Robert Dickey, and Attorney General William Henry. Dickey arrived in Charlottetown on August 30 and his fellow delegates joined him the following evening. Official proceedings began on the afternoon of September 1 -- after the arrival of the Canadian delegates -- with the appointment of officers. After deciding that discussion of Maritime Union could wait, it was agreed to hear the Canadian proposals regarding a larger union. While there are no official records of the closed proceedings, the Halifax Morning Chronicle of September 10, 1864 gives an account of what was said, in an article attributed to Jonathan McCully. Nova Scotians, like the other delegates, took part in the whirl of social activities accompanying the official proceedings. After the official meetings at Charlottetown were over, the delegates continued on a tour of the Maritime colonies. In Nova Scotia, they stopped at Halifax. At the Québec Conference -- where a union in the spirit of the discussions held at Charlottetown was to be formed -- the Nova Scotia delegates were the same gentlemen who had attended the first conference. The Québec negotiations took a different tone and direction from the presentations at Charlottetown, however. The delegates now needed to agree on the actual terms of the proposed union. The first difficulty encountered was the composition of the Senate, and the desire of the Maritime colonies for equal representation in the proposed government. More pressing were the financial arrangements that would allow the provinces to cover the costs of new and existing services. Charles Tupper put forward an agreement, which, while it suited the Canadians, was insufficient to meet Nova Scotia's needs. As at Charlottetown, there were many social activities for the delegates to attend when negotiations were through for the day. For this gathering, however, many delegates were accompanied by wives and daughters, and though Québec did not offer the warm summer weather of Charlottetown, the setting and the people did much to charm the delegates and their families. Even more so than at Charlottetown, these occasions were important in wooing delegates who might have been unsure about supporting the terms of the union. After long hours of deliberation and debate, the delegates at last produced the Québec Resolutions, the guidelines for what would become the British North America Act. The Resolutions covered all aspects of the formation of the proposed new country and its government. Nova Scotian response was varied, ranging from wholehearted support to harsh criticism. After the conference, delegates took a tour of the Canadas, stopping at Montréal, Ottawa, Kingston, Belleville and Toronto. Charles Tupper, as leader of the Nova Scotia delegation, was surprised to meet opposition to the Québec Resolutions when he and the other delegates returned home. The delegates were all supporters of the proposed agreement. Tupper's government also had a comfortable majority in the legislature that would vote on the proposals; he anticipated no difficulty in passing them. Once the Resolutions were made public, however, many prominent figures expressed their opposition. As Christopher Moore states, Nova Scotians felt no particular compulsion for constitutional reform; many others found the financial parts of the agreement completely unacceptable. Chief among the protesters was Joseph Howe. At first, while acting as Imperial Fisheries Commissioner, he was obliged to denounce the resolutions anonymously in a series of newspaper articles called the "Botheration Letters." Later, when he no longer held any imperial responsibilities, he was more overt in his criticism. Another prominent detractor was William Annand, who would become the first Nova Scotian premier of the Confederation era. 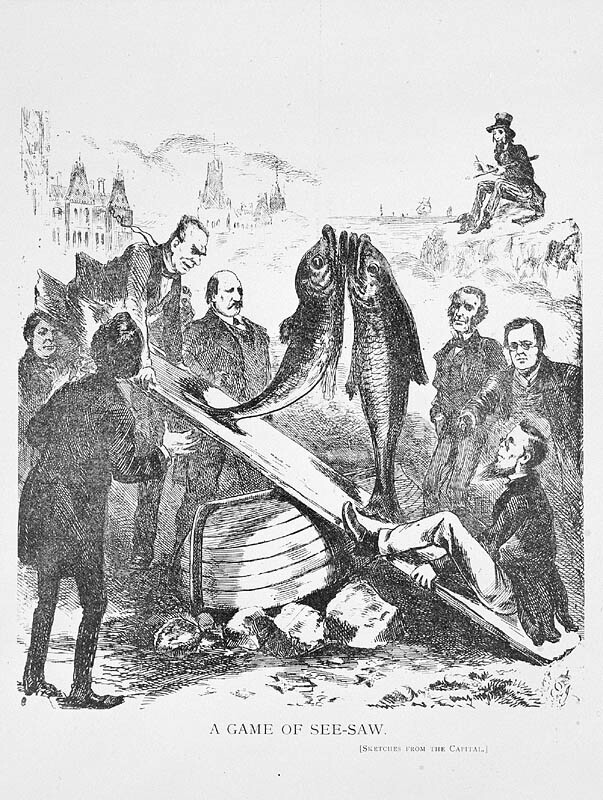 The battle over Confederation was fought in the newspapers as well as in the legislature. The Halifax Morning Chronicle was a prominent supporter of union until William Annand resumed control of the paper from Jonathan McCully, after which time it became one of Confederation's strongest critics. McCully continued publishing his pro-union opinions in the Halifax Unionist. Another supporter of the idea was the Halifax British Colonist, for which Charles Tupper wrote frequently. After the Québec proposal's disastrous showing in New Brunswick's 1865 election, Tupper wished to keep Confederation as far away from the polls as possible. An unpopular school tax he had recently created also promised to make the passage of a union resolution difficult. With his legislative majority, he was able to ignore the increasing agitation to put the matter to a vote before trying to pass it. Tupper reintroduced the concept of Maritime Union in the legislature to divert attention away from Confederation. On April 18, 1866, just as his mandate was about to end, Tupper passed the Québec Resolutions through the legislature. When the general population heard of the government's actions, they protested loudly in print. Although it was too late to reverse the decision, Tupper promised the electorate that he would attempt to make modifications to the act during the London Conference, where the British North America Act was to be finalized. The British North American contingent that travelled to London, England to draft what would become the official version of the British North America Act was smaller than the ones sent to the previous two conferences. The Nova Scotia members were the same, except that John William Ritchie replaced Robert Dickey -- who had expressed last-minute doubts about the Québec agreement's financial terms. The delegates worked hard at creating a final draft out of the Resolutions. They also worried over such details as how to refer to the new union; they eventually settled on "Dominion," from a passage in the Bible reputedly found by Samuel Leonard Tilley. At the same time, those against union had sent their own small delegation, consisting of Howe and Annand, to London to protest Nova Scotia's method of ratification. They wished for a renegotiation for what they called "better terms" within the proposed union. Tupper and the other supporters managed to anticipate every opposition move, while trying to persuade the two delegates that modifications could be made to the document before it reached its final form. Despite his best efforts, however, Tupper was unable to introduce any changes before the agreement received royal assent. In contrast to the pages-long editorial written by George Brown for the Globe, the Eastern Chronicle & Pictou County Advocate featured mocking birth, marriage and death notices in protest of Confederation. While there were celebrations around the province, such as those described in a Lunenburg resident's diary, in Yarmouth there were buildings draped in black crepe in protest. Effigies of Tupper and other union supporters were burned at Halifax, and at other communities around the province. Some people welcomed union, while others were resentful at being forced into it. The newspaper coverage of the time reflects these varying opinions. Anti-Confederation feeling in Nova Scotia also influenced that fall's federal and provincial elections. Thirty-six of the thirty-eight provincial seats went to anti-Confederation candidates. Eighteen of the nineteen available federal seats went the same route -- the only Confederation supporter elected was Charles Tupper, in the riding of Cumberland. 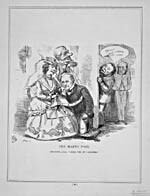 It was feared that the federal members, led by Joseph Howe, would not even attend the first sitting of the new nation's Parliament. (They did appear, although Howe made a speech about his feelings regarding union.) William Annand became Nova Scotia's premier. He and Howe continued to push for the removal of Nova Scotia from Canada. When that failed, they moved to a campaign for so-called "better terms." In this effort they were moderately successful. Eventually, Howe was integrated into the new government, persuaded that there he could better fight for his province's interests. Annand had a falling-out with Howe over this point, and continued to fight Confederation until 1869. The political fate of the delegates varied. Tupper sat in the first Parliament of the new federal government, but did not receive a Cabinet post because of regional representation concerns. Archibald was made the new Secretary of State. McCully, Dickey, and Ritchie were all named as senators. Henry, who lost his seat in the 1867 election, remained active in Nova Scotia politics and was eventually named as one of the first judges to the Supreme Court of Canada in 1875. Interestingly, the repeal movement in Nova Scotia resurfaced in 1886, under Liberal leader William Fielding. He won 26 of the 38 seats that year, on a campaign of repeal and increased subsidies. The short-lived resurgence collapsed, however, when the Conservatives won 14 of 21 seats in the federal election of 1887. The Atlantic provinces in Confederation. -- Ed. E. R. Forbes and D. A. Muise. -- Toronto : University of Toronto Press, 1993. -- 628 p.
The Atlantic region to Confederation : a history. -- Ed. Philip A. Buckner and John G. Reid. -- Toronto : University of Toronto Press, 1994. -- 491 p.
Canadian encyclopedia : year 2000 edition. -- Ed. James H. Marsh. -- 3rd print ed. -- Toronto : McClelland & Stewart Ltd., 1999. -- 2573 p.
Creighton, Donald. 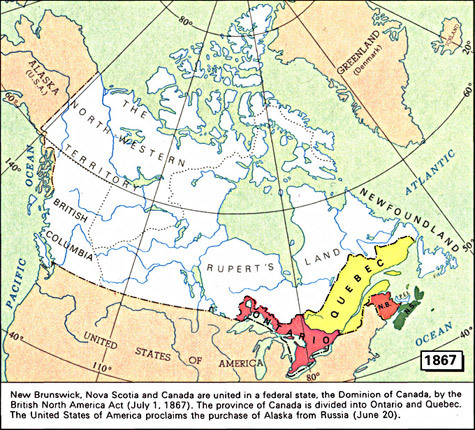 -- The road to Confederation : the emergence of Canada, 1863-1867. -- Toronto : Macmillan of Canada, 1964. -- 489 p.
Morton, W. L. -- The critical years : the union of British North America, 1857-1873. -- Toronto : McClelland & Stewart Ltd., 1964. -- 322 p.